In 1890, the Benedictine Fathers established a priory and seminary on the land that is now Rosaryville and called it Gessen. However, a lack of funds and the difficulty of farming the land forced the monks to look for another site. They found property near Covington, LA, and established what is now called St. Ben’s Abbey. In the meantime, civil strife in Spain made the Spanish Dominican Friars move their House of Philosophy to America so the students would not be forced into military training in Spain. These students could use the Louisiana climate to help in their preparation for missionary work in the Philippines and the Far East. They purchased Gessen from the Benedictines and opened their House in 1911, giving it the name “Rosaryville,” suggested by a Dominican sister in the New Orleans Motherhouse. When the war in Spain claimed the lives of so many friars, priests and teachers, the Spanish Dominicans found it necessary to recall their theologians and novices to Spain. Knowing that the Dominican Sisters were considering moving their novitiate out of New Orleans, the Spanish Fathers gave them the first option on Rosaryville. 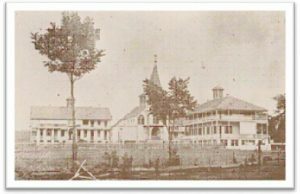 Thus, in 1939 Rosaryville became the noviatiate and retirement home of the Dominican Sisters, Congregation of St. Mary (now the Dominican Sisters of Peace). Rosaryville’s mission has evolved over the years. In 1946, Rosaryville included a residence called The Aspiranture for those girls interested in becoming Dominican women religious. Camp Kateri, a youth camp, was opened in 1969 and in 1981 Rosaryville Spirit Life Center was established. This retreat and conference center continues to minister to adults and youth, providing a nurturing environment to better relationships with God, self, neighbor and all of creation.